I will create simple web application using SpringMVC +MyBatis + AngularJS to show the data from database(MYSQL) on UI page. 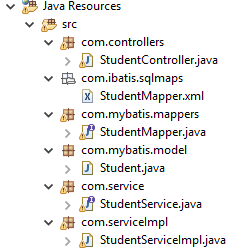 Whenever we run the application first of all it hits the service and then it pass the call to controller, Where it will perform the required action and then calls the mapping resource in order to fetch the details from the database which will turns and displays the data on UI part. where Firstname, Lastname,Email are the field names or column names in MYSQL DB and where class condition should be mentioned in ng-model name in view page.